Hmmmmm, somewhere along the way these weekly report have turned into every other week reports. Not good. I have an excuse this time........ don’t I always?? That machine I was having issues with...... the issues didn’t get fixed, so last Sunday was spent taking it off the rails of the table and packing it into a box and getting it to the UPS store. By the time all that was done, my brain was so fried, not to mention the parts of me that hurt after lifting the thing, that there was no sewing and no blogging to be done. And that then seems to have continued through the week. While the machine is in the long arm hospital, I’ve decided that it’s a good opportunity to do some cleaning and organizing, both in the studio and then downstairs in our apartment. I ask again, why does organizing create such a mess? 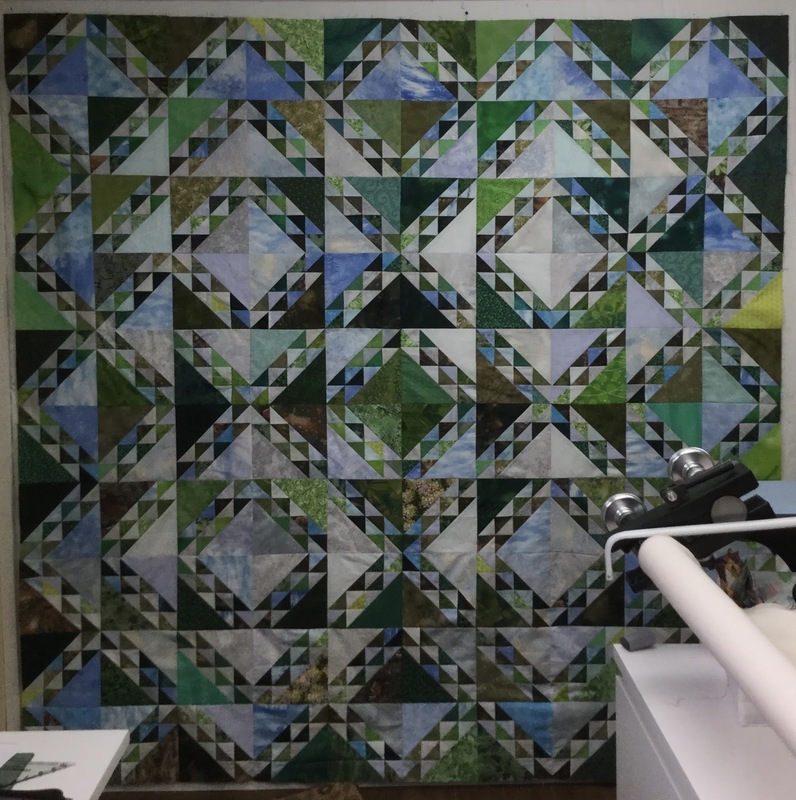 However, during the last couple of weeks I have had the chance to add the last border onto La Passacaglia, and get the corners of those borders mitred and sewn. 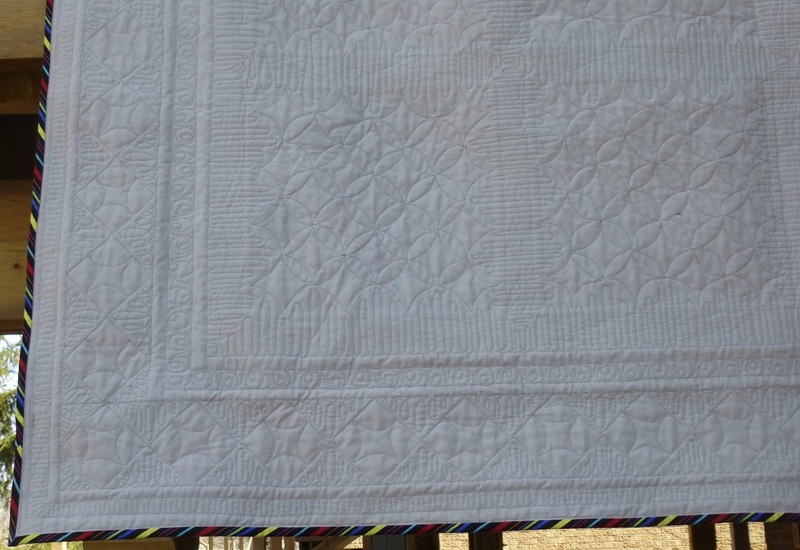 So, all that’s left is to hand stitch down the white pentagons on two more corners. I just might make that finished by the end of April deadline. There’s been some movement in the stash in both directions. A group of friends and I went to the St Mary’s quilt show yesterday, and there was some stash added during that trip. 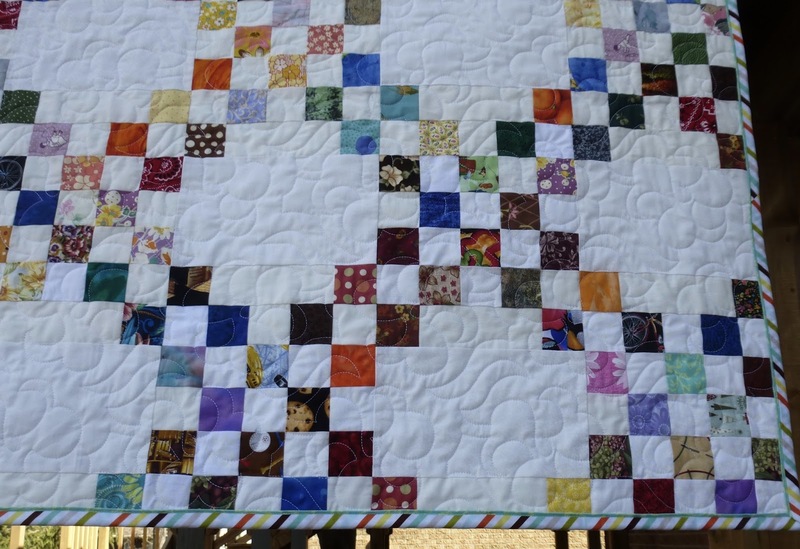 It all has specific quilt destinations, so I’m hoping it will get used up very soon. We’re heading off to church in a little while. 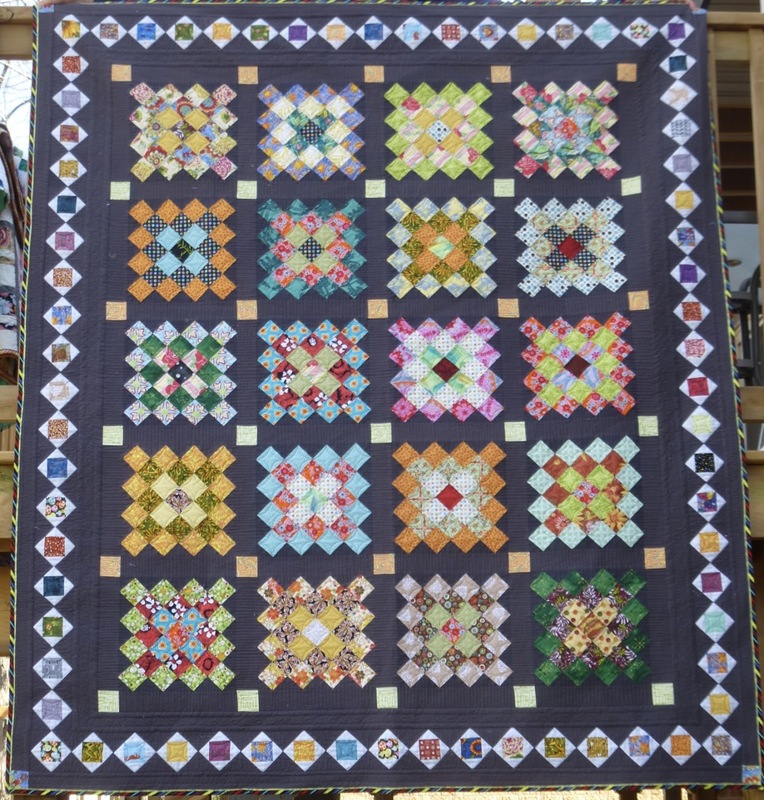 We usually go Saturday evenings, but didn’t make it yesterday due to the quilt show. 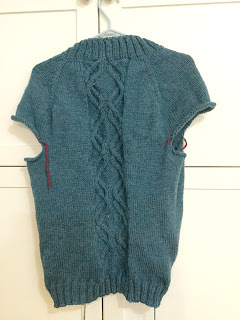 In the meantime, I’m linking up to Judy’s Stash Report, Kathy’s Slow Sunday Stitching and Angie’s WIPs Be Gone. Once we get home from church, there will most definitely be some Slow Sunday Stitching in the plans. APQS are fabulous. Amy has spent many hours in the past couple of days, via FaceTime on our phones, trying to track down the problem. So far no success. She’s sending me out a new part that might be the culprit, which will be here, according to the UPS people, on Friday. If that doesn’t work, the machine will be going for a trip to its birthplace in Iowa for further diagnostics and repair. I wish I had Geordie LaForge here to do a level four diagnostic and repair. Ah well...... 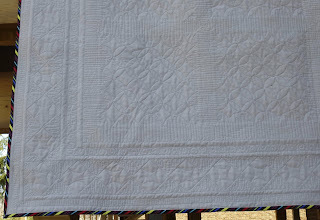 In between playing with all the frighteningly small pieces in that machine, I’ve been getting some of my own projects finished.Northern Tree Line now has its blocks turned the correct way and sewn back in place. It also has a backing made and a label on said backing. I’ve pulled out a UFO, which was started way back in November of 2014. It’s a Sister’s Choice variation. I put it up on the wall to study and to figure out exactly where it was and what needed to be done. There are 18 of the main blocks done. I need 32. This is the main block. 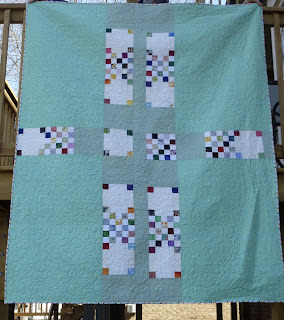 It’s using up the four patches that were left over from my Rainbow Scrap Challenge quilt. 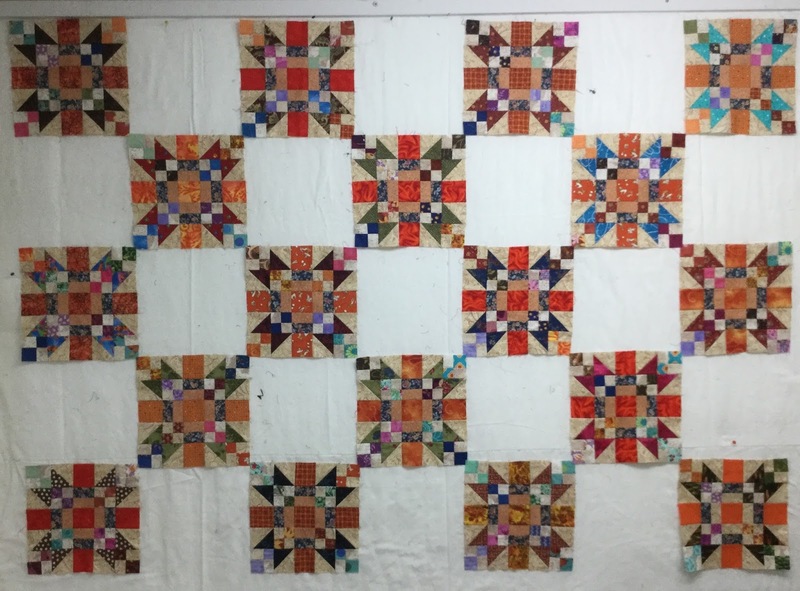 The triangles in each block are the same fabric, but those fabrics change from block to block, in an attempt to use up 2 1/2 inch scraps. 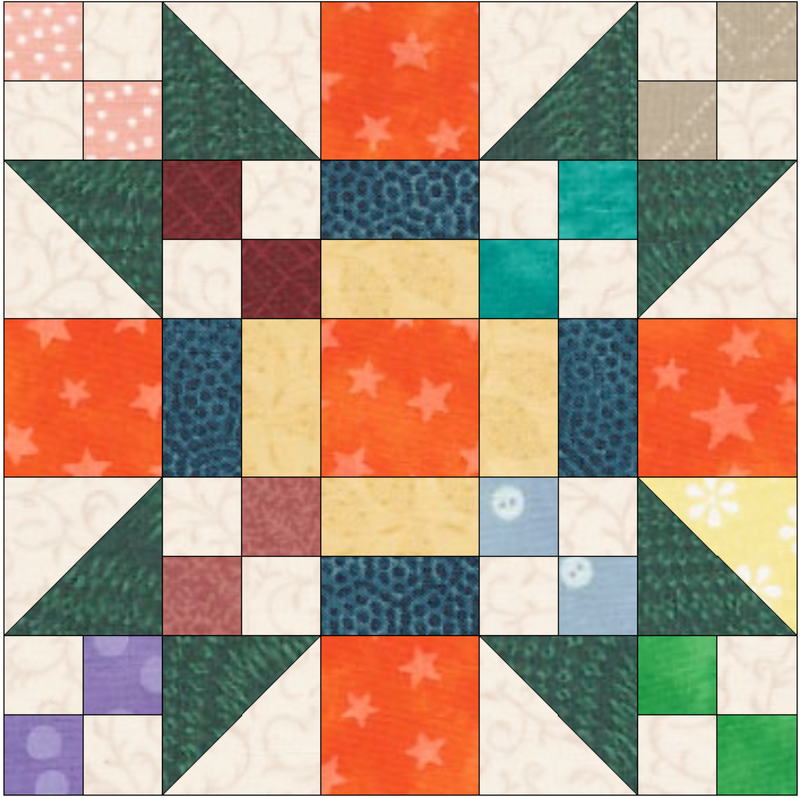 This will be the alternate block. I’m not quite sure yet what colour those green triangles will end up. 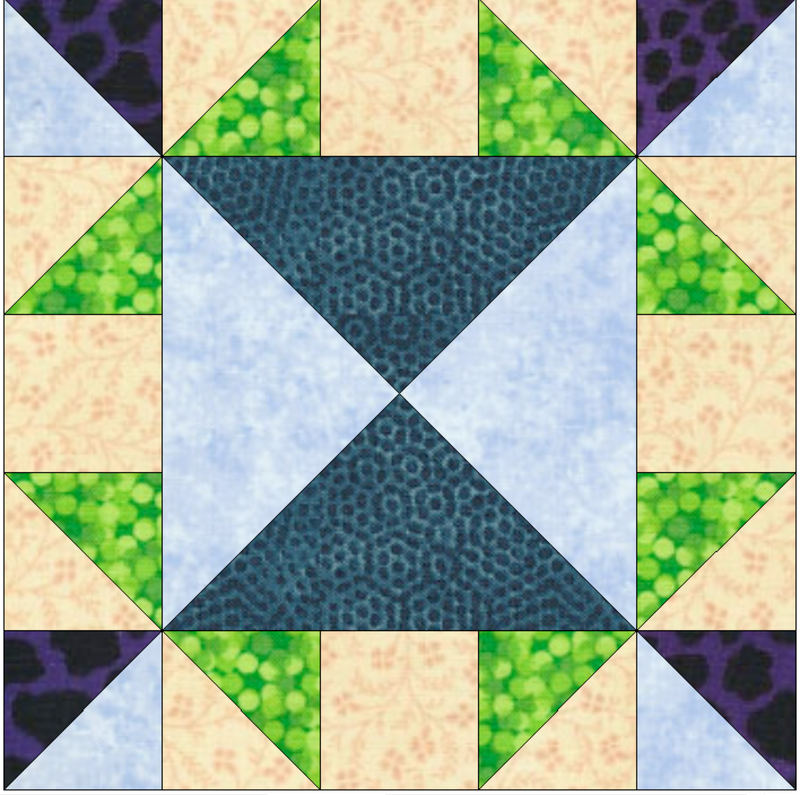 I really like the contrast the provide in the quilt, but I don’t have enough green like that in my stash, which could be good excuse for some stash enhancement. And this is the finished layout. 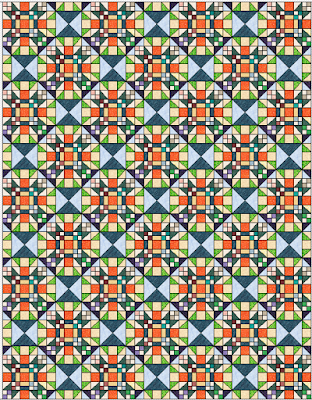 This whole thing was designed in Electric Quilt 7 software. It has yet to tell me whether it wants borders or not. The blocks finish at 10 inches. 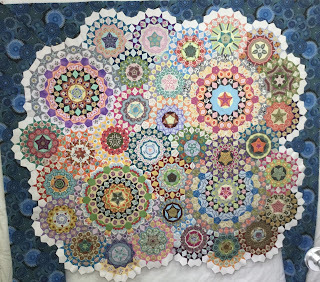 The quilt, as it is now, will be 70x90. 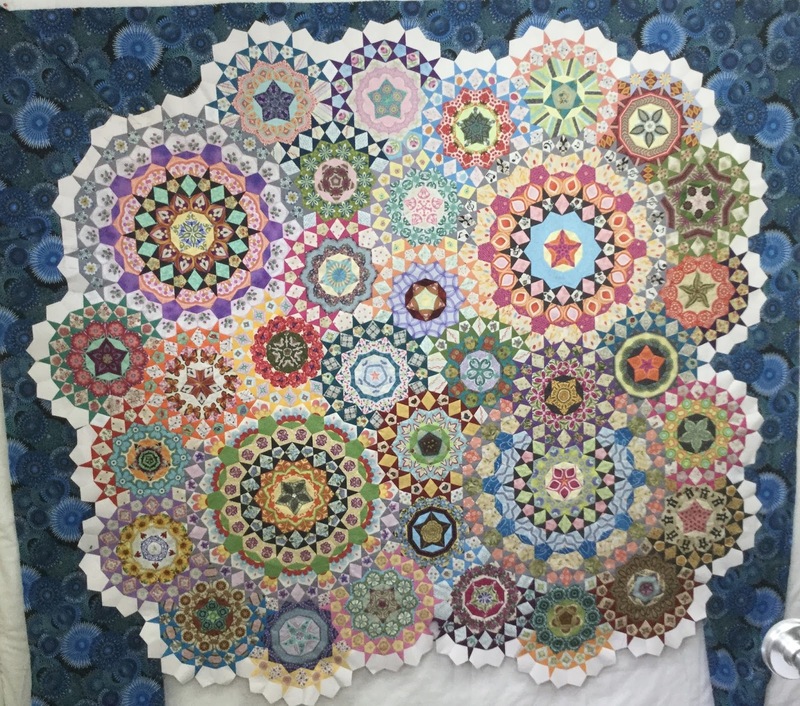 In addition to all this, all of the white pentagons, excepting the corners are stitched onto the blue borders for La Passacaglia. The corners of the blue borders have been mitred and sewn. 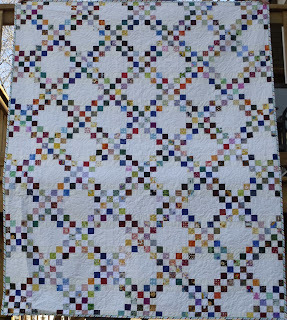 All that is left is to sew the white pentagons to the corners of the border fabric and it is done! That will happen over the course of the next couple of Slow Stitching Sundays. I’m linking up to Lorna’s Let’s Be Social and also to The Needle and Thread Network. After that, I’m going to go play with some Sister’s Choice blocks and do some homework for a workshop I’m taking on Friday. Sunday Slow Stitching and Stash report. Today on her Sunday Stitching post, Kathy talked about hand stitching as being a way to relieve stress, and that we who love it should not feel guilty for taking the time to do it. Not only that, but it’s an essential part of relieving the stress of life. She is so right! It isn’t a big thing in the overall scheme of things, but yesterday I was so stressed. It was time for some maintenance on my long arm machine. She was doing some pretty weird things with the stitch regulator. I had some new parts here, so yesterday was the day we decided to install them. APQS, the maker of my machine always sends out very detailed and easy to follow instructions on how to install new parts when necessary. We had to take it apart, and this is how the insides look..... very scary! We went step by step through the process, in this case installing new circuit boards, following the instructions exactly as written and the pictures as shown. Once we got to the part of the instructions that said to turn the machine on and test the needle up/down speed, We did that....... zero, zip, nada happened. The machine turned on but not a move did she make. Have I mentioned before that there are times, not many thankfully, that I would cheerfully throw this thing out the window, assuming that I could lift it? Well, yesterday was one of them. By the end of the day I’d calmed down. Going to church to worship helped immensely. And today, I’m doing what Kathy suggests is necessary to my sanity and my health. I’m slowly hand stitching on La Passacaglia. The third side of the border is almost done. I should be able to get the fourth border pinned in place and started today. I’ve had a very loose mental goal of getting this finished by the end of April. If it continues this way, I just might make it. Between the fabric for these borders, and making a backing for Northern Tree Line, I’ve had some stash used progress. 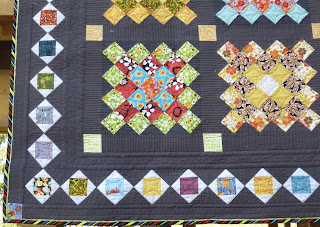 I’m linking up with Kathy’s Slow Sunday Stitching, Judy’s Stash Report and Angie’s WIPs Be Gone. I think I’ll take some time for a cup of tea and a browse through some of those links, and then it will be back to more stitching. I’ve finished sewing together Northern Tree Line. I was so pleased with myself when I put it up on the wall and took a picture of it. 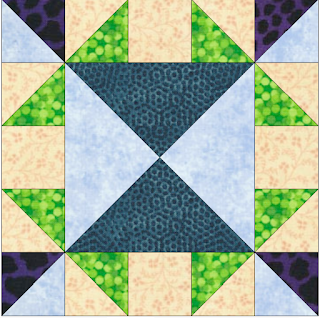 Then I went right into cutting and piecing leftover large triangles for the backing. 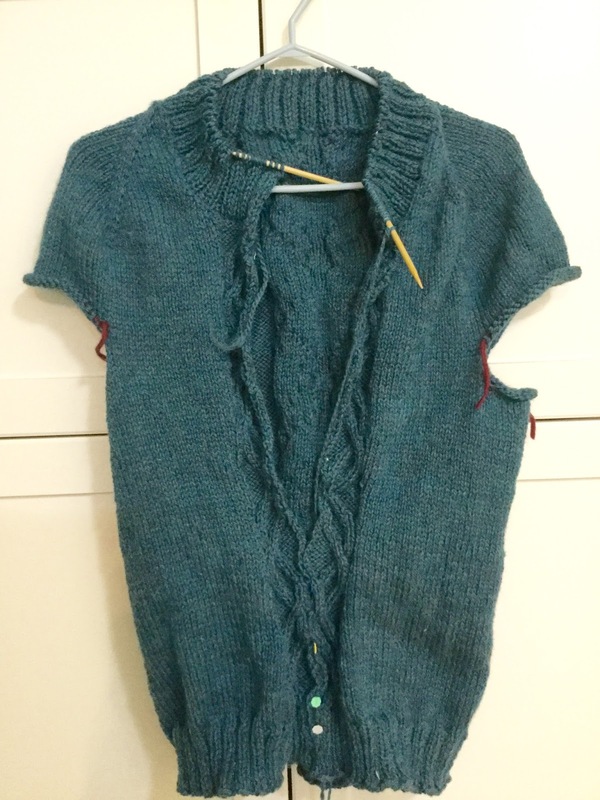 After supper, I sat down to start writing this blog post celebrating this top being finished and looked at the picture.......... something’s wrong........ There are not one, not two, but three blocks turned the wrong way! Grrrrr....So instead of feeling great about the finish, I went into the having to rip stuff out doldrums. Thankfully it isn’t a difficult fix. With some selective ripping they can all be removed, turned the way they should be, and put back in. In fact, two of them have been ripped out and sewn back in place. The first one took two tries. I ripped it out, sewed it back in, looked at it, and realized I’d sewn it in wrong again, only wrong in a different way......... sigh......... This is the down side to having a design where each of the blocks is turned a different way in order to get secondary effects. I’ll finish the last of it tomorrow. Tonight, my brain is fried. So, I’m going to link this up to Lorna’s Let’s Bee Social and then find something fairly mindless to do. I’m continuing to work away at my Traveller’s End sweater. I’ve finished the body and am now working on the collar. After that I think I’ll do the button bands. I think it might be easier to do that part before the bulk of the sleeves are on. Less weight to heave around. Earlier this week I found out that little Abbie was going out for the day to meet friends, so I thought is might be fun to make up a new hat to go with her Crocodile Booties. Here’s the hat, a quick crochet from a pattern called Posey Patch Hat. And a side view. 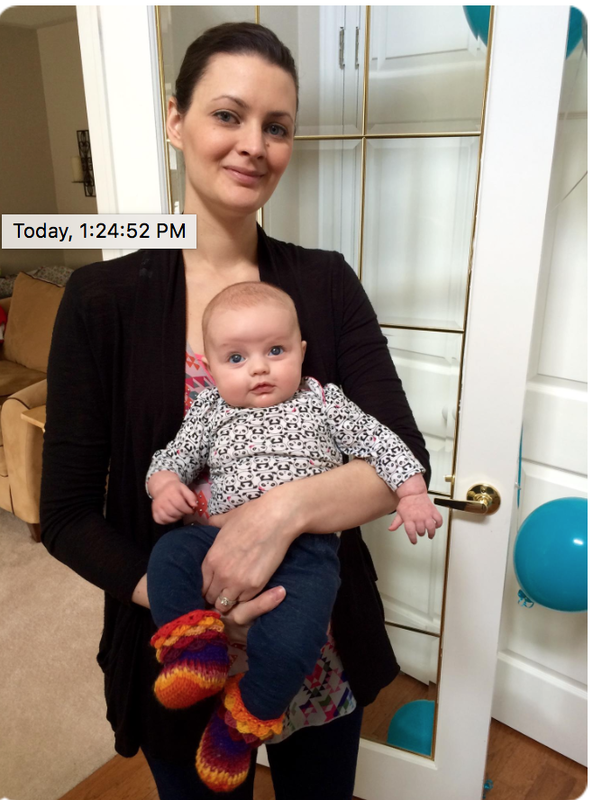 Here she is with her Mama, with her booties on her feet, all ready for her day out. I’m linking up to Judy’s On the Needles, a day late, but better than not at all, and then I’m going back to more knitting. I have two finishes to share today. They’ve been done for quite a while now, but the conditions for taking pictures of them weren’t suitable until last Sunday, when it was warm and sunny and not windy all on the same day. 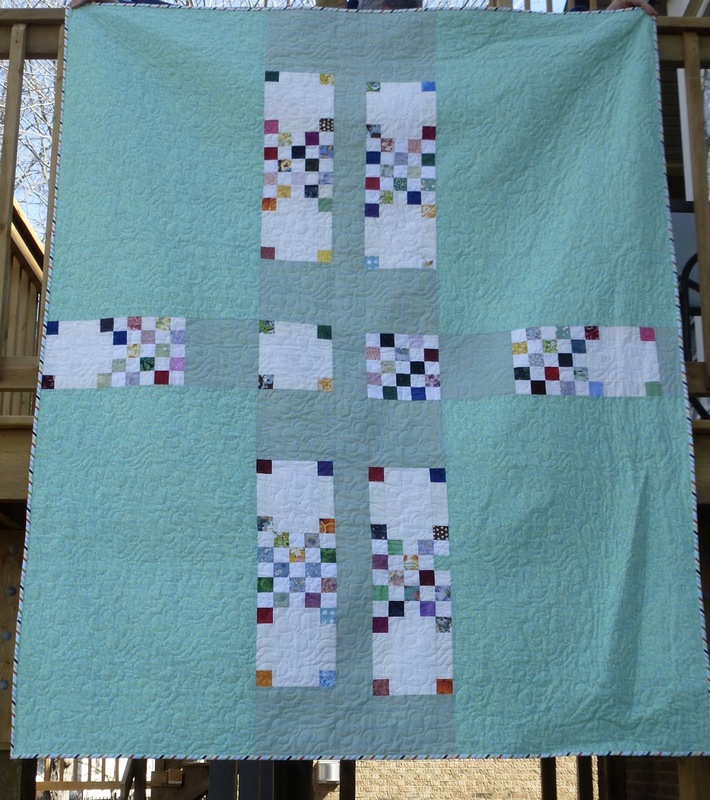 The first finish is my Scrappy Irish Chain. According to past records on this blog, I started this as a leader/ender project in January of 2012. The piecing was finished sometime in October of 2014. And then it sat and waited for its turn to come in the quilting line up. It was quilted using a pantograph called Pinwheel Flower. That happened in January of this year, finally. 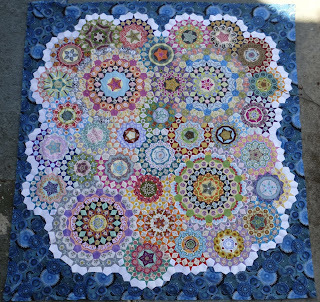 I’m on an unofficial mission to finish one of my quilts each month this year. 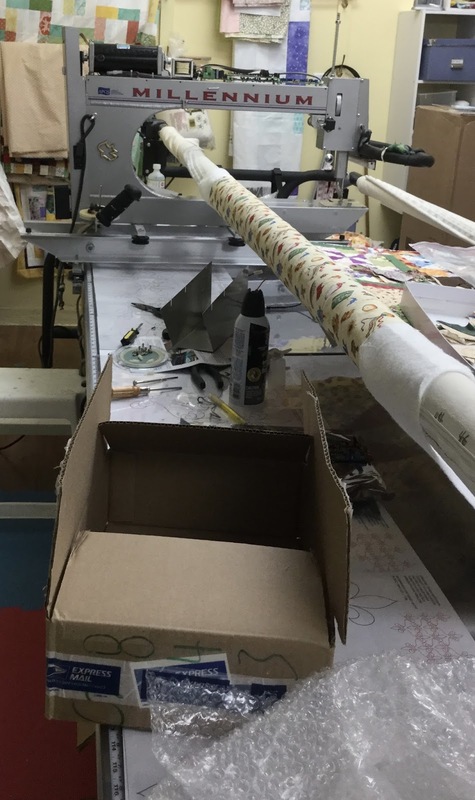 It was bound with a diagonal striped and faux piping, making the binding 100% machine finished. The back is almost as fun as the front. 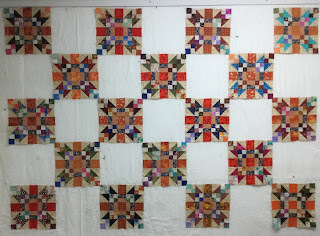 I had some blocks left over and pieced them into the backing. 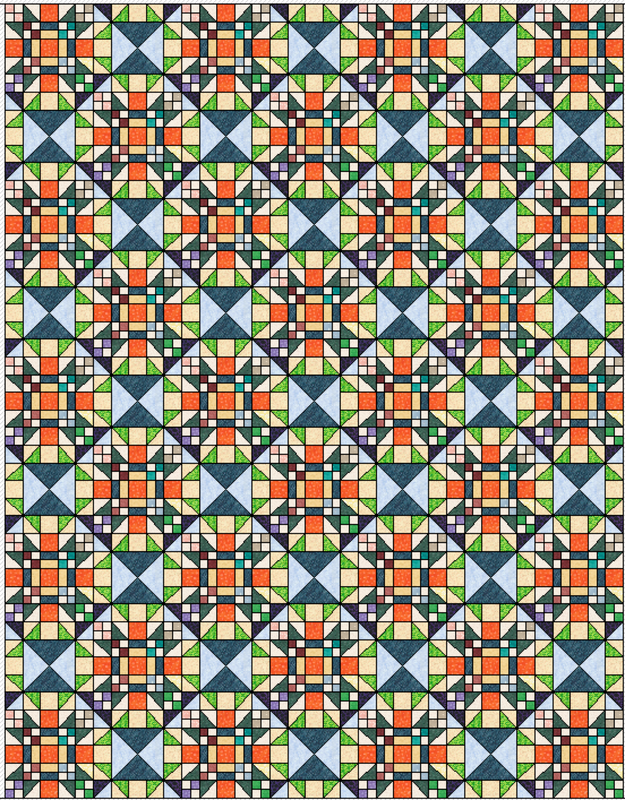 At some point, before October’s quilt show, I’ll get the information about this quilt written into the white area of one of the blocks on the back to make a label. 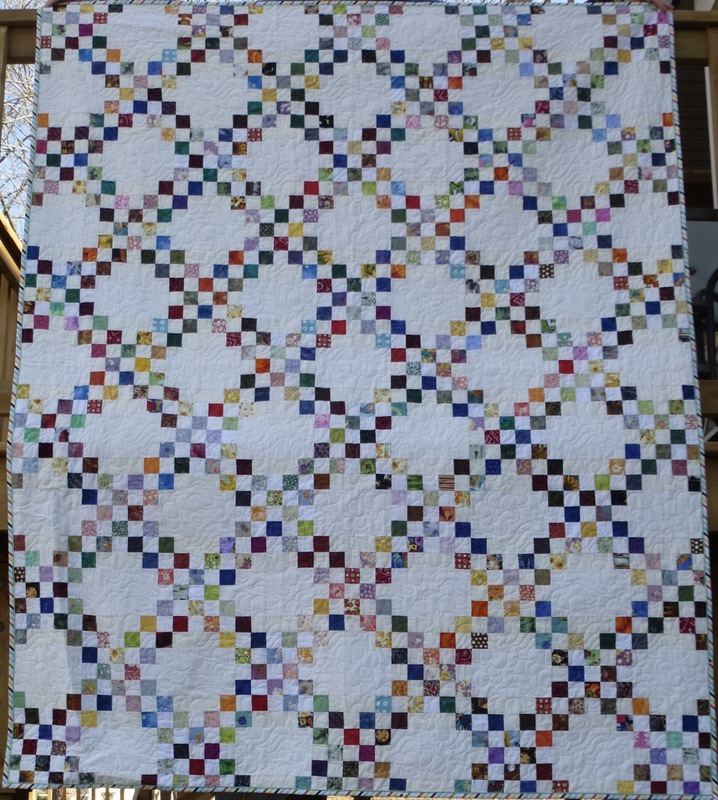 continuous curves in the squares, squiggly lines in the sashes and straight line with loops in the middle for the plain borders.It got finished with a diagonal striped faux piped binding. Here’s a look at the back. 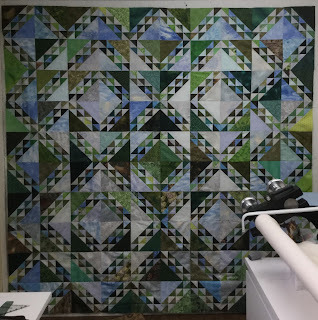 I’m linking up to Crazy Mom Quilts Finish it up Friday and also to Angie’s WIPs Be Gone, because these WIPs are now gone for good.